Some photos from last night's class. 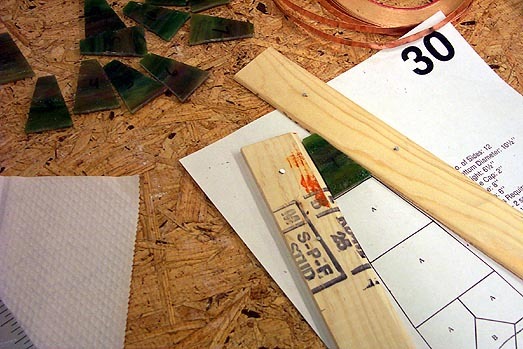 Lamp pieces need to be really precisely cut if they are to all fit together for a nice tight 3D construction. I spent most of class sliding pieces into a wooden jig, nailed on top of a copy of my pattern, to make sure everything is sized properly. The idea is to work one "ring" of the lamp at a time, downward from the top, and reposition the jig as needed for each ring. This would probably be sort of tedious work under the best of circumstances, but was maddeningly so at class last night: any time I found a piece that was a hair too big (which is to say, every one of them) I'd have to walk over to the grinders in the other room, shave off a fraction of an inch, come back, fit it again... wash, rinse, repeat. I probably walked a mile last night without ever leaving the building. 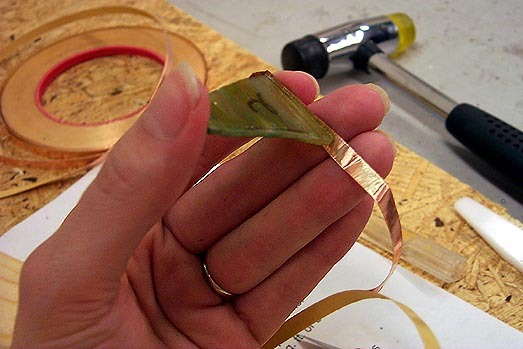 And, here's me, foiling lamp pieces. Also fairly tedious work, especially on glass like the Youghiogheny I'm working with on this project. The sheets don't come flat, but instead sort of warped, like plywood that's been rode hard and put up wet. If the piece being foiled in the above photo appears to have a curvy-cut edge---it doesn't, the cut is perfectly straight, when the piece is viewed straight on. Rather, the curve you can see is in the cross-section of the glass itself. Not only does that make foiling even pickier than it has to be, but it also makes me suspicious that the curvature is going to have to make my life difficult somehow, come construction time. And, oh---I was right; the cream-colored glass I'll be using for the accent pieces in this lamp is a Bullseye. I'm entirely too pleased that I was able to guess that based on its texture alone; clever me. When your hobby makes you think you need a hobby, what then? You know, I was sitting in Applebee's last night looking at all the stained-glass lampshades, and it made me think of you and your current project. Dumb question...is that blood on the ruler, or red paint? If it's blood then "Adventures in Dangerous Art" is aptly named. Best of luck in all your endeavours...I hope it turns into a profitable venture for you! heh. My secret goal in all of this is to make a nice hanging swag-type lamp, for a corner of the living room that's a little on the dim side but is so occupied by a giant couch that there's no place for a table lamp. I am hoping, though, that it WON'T look like something out of Applebee's. Last thing I need is for houseguests to start asking things like "Can I get something to nibble on? Some pizza shooters, shrimp poppers, or extreme fajitas?" Linda: I'm not sure what the red stuff is, but I've shed remarkably little blood so far in this project, so I'm thinking that's not me. Of course, now that I've said that, next time I write I'll be all "Taking twenty-three stitches hurts less than I had previously imagined..."
Yaaack! The whole Applebee's thing wasn't a comment on your glass-assembly skills, Michelle. I tend to think of this site whenever I encounter stained glass .. I just happened to be sitting in that particular restaurant at the time. God, your stuff is tons better. aww, s'okay, Adrith, I knew what you meant :) And it's a good thing. I've got branding! I've got eyeballs! I've got... *mindspace* ! Diners can be nice. Fried food makes me warm-and-fuzzy inside. Onion rings have to be *battered* though... none of that weird dry, flavorless, crumb coating stuff, which is a scourge akin to that of Miracle Whip, which, don't even get me started.